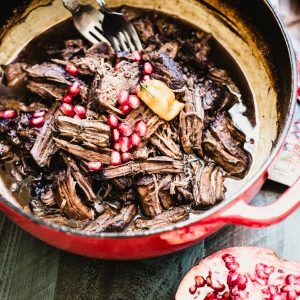 This Pomegranate Habanero Shredded Beef recipe will knock your socks off with how easy and flavorful it is. Paleo & Whole30-friendly! Preheat the oven to 325°F. Pat the roast VERY dry with paper towels and season with the salt. You want the meat to be very dry so that a nice crust will form when you sear it. Otherwise the surface will steam instead of brown. Heat a Dutch oven over medium-high heat, then add the ghee. (Ghee is great for searing meat because it has such a high smoke point.) Sear all sides for about 4 to 6 minutes each or until a golden brown crust forms. Turn off the heat, and add the habanero (or jalapeño), beef broth, and pomegranate juice. Put the lid on the Dutch oven and put the pot into the oven. Bake for about 3 hrs or until the meat is very tender. Shred with two forks. It’s great served over roasted sweet potatoes. Bonus points for serving with a drizzle of pomegranate reduction. To make that, pour ½ cup pomegranate juice into a small pot. Bring to a boil then reduce to a simmer until the juice has reduced by about half and coats the back of a spoon. Just keep an eye on it because it can burn quite easily. If you’re on Whole30 I would avoid the reduction because of sugar content.